There’s a lot that you need if you’re going on a bicycle ride. Such as tissues or money for ice cream. But where to put it? Thankfully, BABY born’s outfit includes a bum bag. Its colour is mint, and it’s not only very handy, but also totally in fashion. The rest of the outfit can keep up with the bag any day in matters of style. The white shirt has a cool print and the collar and cuffs match the colour of the trousers. 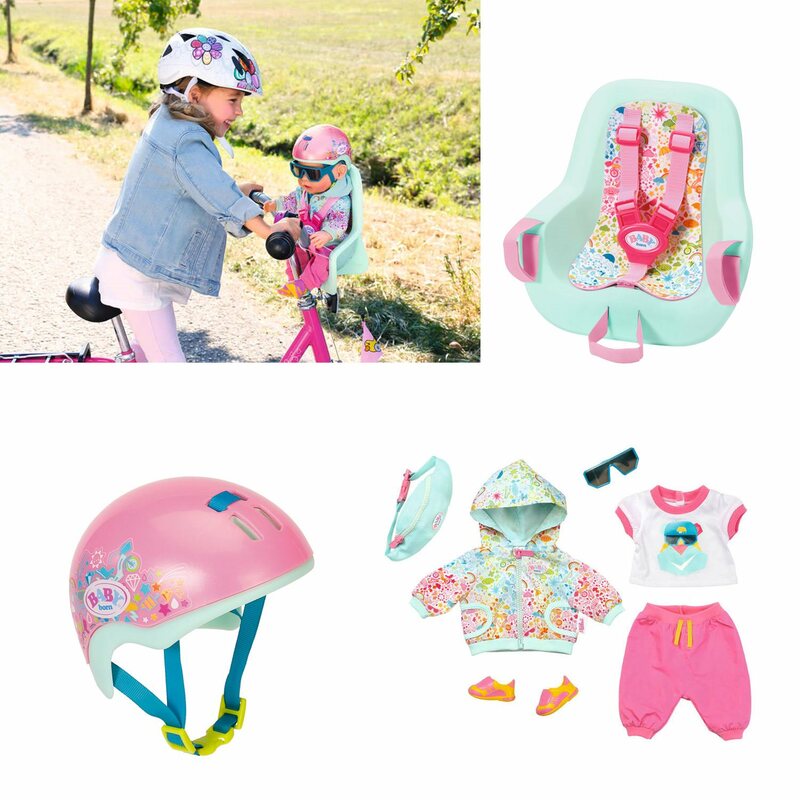 The hooded jacket shows all the symbols that BABY born has seen while out and about. And of course you also need sneakers and sunglasses for your bike ride. BABY born always wears her bicycle helmet because safety comes first. No matter whether she’s cycling herself or whether she’s travelling with someone else in her bike seat. 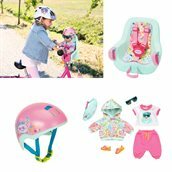 Her helmet is pink with a turquoise strap, making it especially stylish. On its side, it has various symbols in all the colours of the rainbow. BABY born has already seen all of these things on her cycling trips. BABY born is already practising cycling on her bike with stabilisers, but for longer trips, she prefers to ride with someone else. The ergonomic seat has a Velcro strap to attach it to the handlebar of a child’s bike. The mint-coloured seat has a colourful seating area and belt system for a safe trip. This gives the little globetrotter a first-class view of everything around her.